The 2018 Haas F1 Team entry incorporates the new cockpit halo safety device. American-owned Haas F1 Team has unveiled its 2018 race car _ featuring the FIA-mandated “halo” frontal cockpit protection device _ as a prelude to the start of testing for the Formula One World Championship season later this month. The VF-18 is an evolution of the team’s second car, the VF-17, which carried industrialist Gene Haas’ organization to an eighth-place finish in the 2017 constructors standings. Drivers Romain Grosjean and Kevin Magnussen combined to score 47 points in the VF-17 during Haas F1’s sophomore season, 18 points more than the total earned in the organization’s debut campaign in 2016. The VF-18, which made its official debut via the team’s social media platforms and website, is the first 2018 Formula One car to offer the public views of the revolutionary wishbone-like halo device mandated by the Paris-based sanctioning body. Beyond refinement of the previous car, the VF-18 carries the significant addition of the halo and a drastic reduction in the sharkfin. “The regulations stayed pretty stable between 2017 and 2018, so the VF-18 is an evolution of our car from last year,” said Guenther Steiner, team principal, Haas F1 Team. “It’s less about re-invention and more about refinement. You see elements we had from last year on the car this year. “The biggest part of the car’s evolution was the addition of the halo. It took quite a bit of study by the aerodynamicists, but the designers had to work hard to modify the chassis so the halo could survive the mandated loads. The total minimum weight of the car increased because of the halo, and there’s a higher center of gravity simply because of the halo’s position. But everyone is in the same boat. F1 drivers approached the FIA in 2016 about developing a protective cockpit device in an effort to eliminate fatal accidents caused by head injuries. In addition to the halo, the F1 Strategy Group also tested an aero-screen _ a windshield mounted on twin pillars attached to the coaming/raised border on either side of the cockpit. The Strategy Group found the halo to be more effective. Three significant major risk types _ car-to-car contact, car-to-environment contact and external objects _ were studied. Tests revealed that in the case of car-to-car incidents the halo withstood 15-times the static load of the full mass of the car and significantly reduced the potential for injuries. Car-to-environment tests established that the halo prevented helmet contact with a wall or a barrier in many cases, using a selection of previous incidents as a reference. In the case of external objects, the halo was found to successfully deflect large objects away from the cockpit while also demonstrating an increased net level of protection against small debris. Haas built Haas Automation into the largest machine tool manufacturer in North America by focusing on the details amid constant refinement. He has applied those same attributes his F1 team. 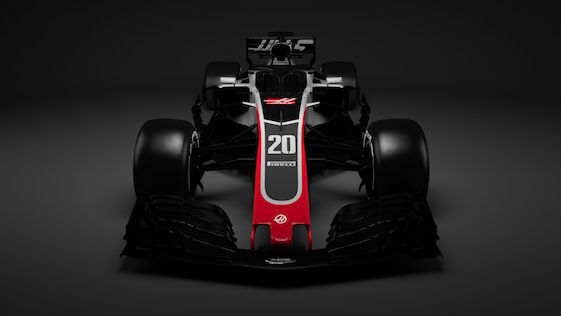 Gray makes up the majority of the livery, augmented by tones of red and black incorporating the look of Haas Automation’s line of vertical and horizontal machining centers, turning centers and rotary tables and indexers. As chairman of Haas F1 Team, the “F1” moniker of that first machine took on added significance as Haas continues to utilize Formula One to build Haas Automation into a premium, global brand. Along those lines, the VF-18 is designed to showcase Haas Automation’s commitment to technology and innovation to F1’s passionate, global audience via a 21-race schedule that includes the United States Grand Prix at Circuit of The Americas in Austin, Texas. The VF-18 will launch its testing schedule at Circuit de Barcelona – Catalunya in Spain from Feb. 26-March 1 and again March 6-9 before the season-opening Australian Grand Prix on March 25 in Melbourne, Australia. Haas F1’s eighth-place finish in the constructors standings last year outpaced the storied McLaren organization (ninth) led by two-time F1 World Driving Champion Fernando Alonso and Sauber (10th) in a battle of “mid-pack” teams. While Haas F1 failed to reach its preseason goal of 50 constructor points, the 47 earned in 2017 were 18 more than the total posted during its debut season in 2016. That inaugural season netted 29 points, most of any new team in this millennium. When Jaguar debuted in 2000 and when Toyota came on the scene in 2002, each organization managed only two point-paying finishes during their entire first seasons for a combined total of six points. Frenchman Grosjean, who has competed in every race in Haas F1’s history, placed 13th in the championship standings with 28 points in the No. 8 Ferrari-powered VF-17. Magnussen, a native of Denmark, finished 14th in the driver standings during his first year in the cockpit of the sister No. 20 car. Haas F1 Team is based at the same North Carolina campus that houses Stewart-Haas Racing, the championship-winning NASCAR Cup Series organization Haas co-owns with retired three-time champion Tony Stewart. Founded by Haas in 1983, Haas Automation, Inc., is America’s leading builder of CNC machine tools. Haas Automation employs approximately 1,300 at its 1.1-million square-foot/102,000 square-meter headquarters in Oxnard, Calif. Haas Automation exports its machines to more than 60 countries through a worldwide network of Haas Factory Outlets.